Computer monitors are typically packed into low stacks on wooden pallets for recycling and then shrink-wrapped. In 2009, 38% of computers and a quarter of total electronic waste was recycled in the United States, 5% and 3% up from 3 years prior respectively. Since its inception in the early 1990s, more and more devices are recycled worldwide due to increased awareness and investment. Electronic recycling occurs primarily in order to recover valuable rare earth metals and precious metals, which are in short supply, as well as plastics and metals. These are resold or used in new devices after purification, in effect creating a circular economy. Recycling is considered environmentally friendly because it prevents hazardous waste, including heavy metals and carcinogens, from entering the atmosphere, landfill or waterways. While electronics consist a small fraction of total waste generated, they are far more dangerous. There is stringent legislation designed to enforce and encourage the sustainable disposal of appliances, the most notable being the Waste Electrical and Electronic Equipment Directive of the European Union and the United States National Computer Recycling Act. Opponents argue that recycling is expensive and ineffective, that it does not safeguard data and that it stifles innovation. It is also criticised for exporting, often illegally, large volumes of toxic waste to countries such as India, China and Nigeria for crude manual disassembly by workers who have little regard for the risk to themselves or the environment. Obsolete computers and old electronics are valuable sources for secondary raw materials if recycled; otherwise, these devices are a source of toxins and carcinogens. Rapid technology change, low initial cost, and planned obsolescence have resulted in a fast-growing surplus of computers and other electronic components around the globe. Technical solutions are available, but in most cases a legal framework, collection system, logistics, and other services need to be implemented before applying a technical solution. The U.S. Environmental Protection Agency, estimates 30 to 40 million surplus PCs, classified as "hazardous household waste", would be ready for end-of-life management in the next few years. The U.S. National Safety Council estimates that 75% of all personal computers ever sold are now surplus electronics. 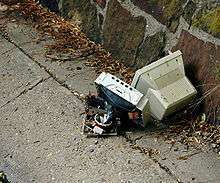 In 2007, the United States Environmental Protection Agency (EPA) stated that more than 63 million computers in the U.S. were traded in for replacements or discarded. Today, 15% of electronic devices and equipment are recycled in the United States. Most electronic waste is sent to landfills or incinerated, which releases materials such as lead, mercury, or cadmium into the soil, groundwater, and atmosphere, thus having a negative impact on the environment. Computer components contain many toxic substances, like dioxins, polychlorinated biphenyls (PCBs), cadmium, chromium, radioactive isotopes and mercury. A typical computer monitor may contain more than 6% lead by weight, much of which is in the lead glass of the cathode ray tube (CRT). A typical 15 inch (38 cm) computer monitor may contain 1.5 pounds (1 kg) of lead but other monitors have been estimated to have up to 8 pounds (4 kg) of lead. Circuit boards contain considerable quantities of lead-tin solders that are more likely to leach into groundwater or create air pollution due to incineration. The processing (e.g. incineration and acid treatments) required to reclaim these precious substances may release, generate, or synthesize toxic byproducts. Export of waste to countries with lower environmental standards is a major concern. The Basel Convention includes hazardous wastes such as, but not limited to, CRT screens as an item that may not be exported transcontinentally without prior consent of both the country exporting and receiving the waste. Companies may find it cost-effective in the short term to sell outdated computers to less developed countries with lax regulations. It is commonly believed that a majority of surplus laptops are routed to developing nations as "dumping grounds for e-waste". The high value of working and reusable laptops, computers, and components (e.g. RAM) can help pay the cost of transportation for many worthless "commodities". The laws governing the exportation of waste electronics are put in place to stop "recycling companies" in developed countries from shipping their waste to 3rd world countries as working devices; they are never working devices. The 3rd world workers scavenge specific items with selling value and throw the rest away to rot and become a health hazard in their own backyard. Recycling one computer and monitor can save 539 pounds of fossil fuel, 48 pounds of chemicals, and 1.5 tons of water . In Switzerland, the first electronic waste recycling system was implemented in 1991, beginning with collection of old refrigerators; over the years, all other electric and electronic devices were gradually added to the system. The established producer responsibility organization is SWICO, mainly handling information, communication, and organization technology. The European Union implemented a similar system in February 2003, under the Waste Electrical and Electronic Equipment Directive (WEEE Directive, 2002/96/EC). Pan European adoption of the Legislation was slow on take-up, with Italy and the United Kingdom being the final member states to pass it into law. The success of the WEEE directive has varied significantly from state to state, with collection rates varying between 13 kilograms per capita per annum to as little as 1 kg per capita per annum. Computers & electronic wastes collected from households within Europe are treated under the WEEE directive via Producer Compliance Schemes (whereby manufacturers of Electronics pay into a scheme that funds its recovery from household waste recycling centres (HWRCs)) and nominated Waste Treatment Facilities (known as Obligated WEEE). However, recycling of ex corporate Computer Hardware and associated electronic equipment falls outside the Producer Compliance Scheme (Known as non-obligated). In the UK, Waste or obsolete corporate related computer hardware is treated via third party Authorized Treatment Facilities, who normally impose a charge for its collection and treatment. The United States Congress considers a number of electronic waste bills, like the National Computer Recycling Act introduced by Congressman Mike Thompson (D-CA). The main federal law governing solid waste is the Resource Conservation and Recovery Act of 1976. It covers only CRTs, though state regulations may differ. There are also separate laws concerning battery disposal. On March 25, 2009, the House Science and Technology Committee approved funding for research on reducing electronic waste and mitigating environmental impact, regarded by sponsor Ralph Hall (R-TX) as the first federal bill to directly address electronic waste. Many states have introduced legislation concerning recycling and reuse of computers or computer parts or other electronics. Most American computer recycling legislations address it from within the larger electronic waste issue. The recently passed Electronic Device Recycling Research and Development Act distributes grants to universities, government labs and private industries for research in developing projects in line with e-waste recycling and refurbishment. In Japan, sellers and manufacturers of certain electronics (such as televisions and air conditioners) are required to recycle them. However, no legislation exists to cover the recycling of computer or cellphone related wastes. It is required in South Korea and Taiwan that sellers and manufacturers of electronics be responsible for recycling 75% of their used products. Electronic waste is often exported to developing countries. 4.5-volt, D, C, AA, AAA, AAAA, A23, 9-volt, CR2032 and LR44 cells are all recyclable in most countries. One theory is that increased regulation of electronic waste and concern over the environmental harm in mature economies creates an economic disincentive to remove residues prior to export. Critics of trade in used electronics maintain that it is too easy for brokers calling themselves recyclers to export unscreened electronic waste to developing countries, such as China, India and parts of Africa, thus avoiding the expense of removing items like bad cathode ray tubes (the processing of which is expensive and difficult). The developing countries are becoming big dump yards of e-waste. Proponents of international trade point to the success of fair trade programs in other industries, where cooperation has led creation of sustainable jobs, and can bring affordable technology in countries where repair and reuse rates are higher. Organizations like A2Z Group (Company Website ) have stepped in to own up the responsibility to collect and recycle e-waste at various locations in India. Thanks to the National Environmental Management Act 1998 and National Environmental Management Waste Act 2008, any person in any position causing harm to the environment and failing to comply with the Waste Act could be fined R10 Million or put into jail or receive both penalties for their transgressions. Consumer recycling options consists of (see below) sale, donating computers directly to organizations in need, sending devices directly back to their original manufacturers, or getting components to a convenient recycler or refurbisher. The rising price of precious metals — coupled with the high rate of unemployment during the Great Recession — has led to a larger number of amateur "for profit" electronics recyclers. Computer parts, for example, are stripped of their most valuable components and sold for scrap. Metals like copper, aluminum, lead, gold and palladium are recovered from computers, televisions and more. In the recycling process, TVs, monitors, mobile phones and computers are typically tested for reuse and repaired. If broken, they may be disassembled for parts still having high value if labour is cheap enough. Other e-waste is shredded to roughly 100 mm pieces and manually checked to separate out toxic batteries and capacitors which contain poisonous metals. The remaining pieces are further shredded to ~10 mm and passed under a magnet to remove ferrous metals. An eddy current ejects non-ferrous metals, which are sorted by density either by a centrifuge or vibrating plates. Precious metals can be dissolved in acid, sorted, and smelted into ingots. The remaining glass and plastic fractions are separated by density and sold to re-processors. TVs and monitors must be manually disassembled to remove either toxic lead in CRTs or the mercury in flat screens. 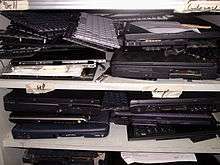 Bulk laptops at a recycling affiliate, broken down into Dell, Gateway Computers, Hewlett-Packard, Sony, and other. Some companies pick up unwanted equipment from businesses, wipe the data clean from the systems, and provide an estimate of the product’s remaining value. For unwanted items that still have value, these firms buy the excess IT hardware and sell refurbished products to those seeking more affordable options than buying new. Companies that specialize in data protection and green disposal processes dispose of both data and used equipment, while employing strict procedures to help improve the environment. Professional IT Asset Disposition (ITAD) firms specialize in corporate computer disposal and recycling services in compliance with local laws and regulations and also offer secure data elimination services that comply with Data remanence standards including National Institute of Standards and Technology. Corporations face risks both for incompletely destroyed data and for improperly disposed computers. In the UK, some recycling companies use a specialized WEEE-registered contractor to dispose IT equipment and electrical appliances, who disposes it safely and legally. In America, companies are liable for compliance with regulations even if the recycling process is outsourced under the Resource Conservation and Recovery Act. Companies can mitigate these risks by requiring waivers of liability, audit trails, certificates of data destruction, signed confidentiality agreements, and random audits of information security. The National Association of Information Destruction is an international trade association for data destruction providers. Online auctions are an alternative for consumers willing to resell for cash less fees, in a complicated, self-managed, competitive environment where paid listings might not sell. Online classified ads can be similarly risky due to forgery scams and uncertainty. When researching computer companies before a computer purchase, consumers can find out if they offer recycling services. Most major computer manufacturers offer some form of recycling. At the user's request they may mail in their old computers, or arrange for pickup from the manufacturer. Hewlett-Packard also offers free recycling, but only one of its "national" recycling programs is available nationally, rather than in one or two specific states. Hewlett-Packard also offers to pick up any computer product of any brand for a fee, and to offer a coupon against the purchase of future computers or components; it was the largest computer recycler in America in 2003, and it has recycled over 750,000,000 pounds (340,000,000 kg) of electronic waste globally since 1995. It encourages the shared approach of collection points for consumers and recyclers to meet. Manufacturers often offer a free replacement service when purchasing a new PC. Dell Computers and Apple Inc. take back old products when one buys a new one. Both refurbish and resell their own computers with a one-year warranty. Many companies purchase and recycle all brands of working and broken laptops and notebook computers from individuals and corporations. Building a market for recycling of desktop computers has proven more difficult than exchange programs for laptops, smartphones and other smaller electronics. A basic business model is to provide a seller an instant online quote based on laptop characteristics, then to send a shipping label and prepaid box to the seller, to erase, reformat, and process the laptop, and to pay rapidly by cheque. A majority of these companies are also generalized electronic waste recyclers as well; organizations that recycle computers exclusively include Cash For Laptops, a laptop refurbisher in Nevada that claims to be the first to buy laptops online, in 2001. With the constant rising costs due to inflation, many families or schools do not have the sufficient funds available for computers to be utilized along with education standards. Families also impacted by disaster suffer as well due to the financial impact of the situation they have incurred. Many nonprofit organizations, such as InterConnection.org, can be found locally as well as around the web and give detailed descriptions as to what methods are used for dissemination and detailed instructions on how to donate. The impact can be seen locally and globally, affecting thousands of those in need. In Canada non profit organizations engaged in computer recycling, such as The Electronic Recycling Association Calgary, Edmonton, Vancouver, Winnipeg, Toronto, Montreal, Computers for Schools Canada wide, are very active in collecting and refurbishing computers and laptops to help the non profit and charitable sectors and schools. The term junkyard computing is a colloquial expression for using old or inferior hardware to fulfill computational tasks while handling reliability and availability on software level. It utilizes abstraction of computational resources via software, allowing hardware replacement at very low effort. Ease of replacement is hereby a corner point since hardware failures are expected at any time due to the condition of the underlying infrastructure. This paradigm became more widely used with the introduction of cluster orchestration software like Kubernetes or Apache Mesos, since large monolithic applications require reliability and availability on machine level whereas this kind of software is fault tolerant by design. Those orchestration tools also introduced fairly fast set-up processes allowing to use junkyard computing economically and even making this pattern applicable in the first place. Further use cases were introduced when continuous delivery was getting more widely accepted. Infrastructure to execute tests and static code analysis was needed which requires as much performance as possible while being extremely cost effective. From an economical and technological perspective, junkyard computing is only practicable for a small amount of users or companies. It already requires a descend amount of physical machines to compensate hardware failures while maintaining the required reliability and availability. This implies a direct need for a matching underling infrastructure to house all the computers and servers. Scaling this paradigm is also quiet limited due to the increasing importance of factors like power efficiency and maintenance efforts, making this kind of computing perfect for mid-sized applications. Although consumer electronics such as the radio have been popular since the 1920s, recycling was almost unheard of until the early 1990s. At the end of the 1970s the accelerating pace of domestic consumer electronics drastically shortened the lifespan of electronics such as TVs, VCRs and audio. New innovations appeared more quickly, making older equipment considered obsolete. Increased complexity and sophistication of manufacture made local repair more difficult. The retail market shifted gradually, but substantially from a few high-value items that were cherished for years and repaired when necessary, to short-lived items that were rapidly replaced owing to wear or simply fashion, and discarded rather than repaired. This was particularly evident in computing, highlighted by Moore's Law. In 1988 two severe incidents highlighted the approaching e-waste crisis. The cargo barge Khian Sea, was loaded with more than 14,000 tons of toxic ash from Pennsylvania which had been refused acceptance in New Jersey and the Caribbean. After sailing for 16 months, all the waste was dumped as "topsoil fertiliser" in Haiti and in the Bay of Bengal by November 1988. In June 1988, a large illegal toxic waste dump which had been created by an Italian company was discovered. This led to the formation of the Basel Convention to stem the flow of poisonous substances from developed countries in 1989. In 1991, the first electronic waste recycling system was implemented in Switzerland, beginning with collection of old refrigerators but gradually expanding to cover all devices. The organisation SWICO handles the programme, and is a partnership between IT retailers. The first publication to report the recycling of computers and electronic waste was published on the front page of the New York Times on April 14, 1993 by columnist Steve Lohr. It detailed the work of Advanced Recovery Inc., a small recycler, in trying to safely dismantle computers, even if most waste was landfilled. Several other companies emerged in the early 1990s, chiefly in Europe, where national 'take back' laws compelled retailers to use them. After these schemes were set up, many countries did not have the capacity to deal with the sheer quantity of e-waste they generated or its hazardous nature. 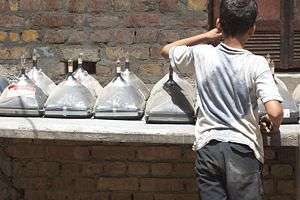 They began to export the problem to developing countries without enforced environmental legislation. This is cheaper: the cost of recycling of computer monitors in the US is ten times more than in China. Demand in Asia for electronic waste began to grow when scrap yards found they could extract valuable substances such as copper, iron, silicon, nickel and gold, during the recycling process. The 2000s saw a large increase in both the sale of electronic devices and their growth as a waste stream: in 2002 e-waste grew faster than any other type of waste in the EU. This caused investment in modern, automated facilities to cope with the influx of redundant appliances. "E-cycling" or "E-waste" is an initiative by the United States Environmental Protection Agency (EPA) which refers to donations, reuse, shredding and general collection of used electronics. Generically, the term refers to the process of collecting, brokering, disassembling, repairing and recycling the components or metals contained in used or discarded electronic equipment, otherwise known as electronic waste (e-waste). "E-cyclable" items include, but are not limited to: televisions, computers, microwave ovens, vacuum cleaners, telephones and cellular phones, stereos, and VCRs and DVDs just about anything that has a cord, light or takes some kind of battery. Investment in e-cycling facilities has been increasing recently due to technology’s rapid rate of obsolescence, concern over improper methods, and opportunities for manufacturers to influence the secondary market (used and reused products). The higher metal prices is also having more recycling taking place. The controversy around methods stems from a lack of agreement over preferred outcomes. World markets with lower disposable incomes, consider 75% repair and reuse to be valuable enough to justify 25% disposal. Debate and certification standards may be leading to better definitions, though civil law contracts, governing the expected process are still vital to any contracted process, as poorly defined as "e-cycling". The e-waste disposal occurring after processing for reuse, repair of equipment, and recovery of metals may be unethical or illegal when e-scrap of many kinds is transported overseas to developing countries for such processing. It is transported as if to be repaired and/or recycled, but after processing the less valuable e-scrap becomes e-waste/pollution there. Another point of view is that the net environmental cost must be compared to and include the mining, refining and extraction with its waste and pollution cost of new products manufactured to replace secondary products which are routinely destroyed in wealthier nations, and which cannot economically be repaired in older or obsolete products. As an example of negative impacts of e-waste, pollution of groundwater has become so serious in areas surrounding China’s landfills that water must be shipped in from 18 miles (29 km) away. However, mining of new metals can have even broader impacts on groundwater. Either thorough e-cycling processing, domestic processing or overseas repair, can help the environment by avoiding pollution. Such e-cycling can theoretically be a sustainable alternative to disposing of e-waste in landfills. In addition, e-cycling allows for the reclamation of potential conflict minerals, like gold and wolframite, which requires less of those to be mined and lessens the potential money flow to militias and other exploitative actors in third-world that profit from mining them. Supporters of one form of "required e-cycling" legislation argue that e-cycling saves taxpayers money, as the financial responsibility would be shifted from the taxpayer to the manufacturers. Advocates of more simple legislation (such as landfill bans for e-waste) argue that involving manufacturers does not reduce the cost to consumers, if reuse value is lost, and the resulting costs are then passed on to consumers in new products, particularly affecting markets which can hardly afford new products. It is theorized that manufacturers who take part in e-cycling would be motivated to use fewer materials in the production process, create longer lasting products, and implement safer, more efficient recycling systems. This theory is sharply disputed and has never been demonstrated. The critics of e-cycling are just as vocal as its advocates. According to the Reason Foundation, e-cycling only raises the product and waste management costs of e-waste for consumers and limits innovation on the part of high-tech companies. They also believe that e-cycling facilities could unintentionally cause great harm to the environment. Critics claim that e-waste doesn’t occupy a significant portion of total waste. According to a European study, only 4% of waste is electronic. Another opposition to e-cycling is that many problems are posed in disassembly: the process is costly and dangerous because of the heavy metals of which the electronic products are composed, and as little as 1-5% of the original cost of materials can be retrieved. A final problem that people find is that identity fraud is all too common in regards to the disposal of electronic products. As the programs are legislated, creating winners and losers among e-cyclers with different locations and processes, it may be difficult to distinguish between criticism of e-cycling as a practice, and criticism of the specific legislated means proposed to enhance it. A hefty criticism often lobbed at reuse based recyclers is that people think that they are recycling their electronic waste, when in reality it is actually being exported to developing countries like China, India, and Nigeria. For instance, at free recycling drives, "recyclers" may not be staying true to their word, but selling e-waste overseas or to parts brokers. Studies indicate that 50-80% of the 300,000 to 400,000 tons (270,000 to 360,000 tonnes) of e-waste is being sent overseas, and that approximately 2 million tons (1.8 million tonnes) per year go to U.S. landfills. Although not possible in all circumstances, the best way to e-cycle is to upcycle e-waste. On the other hand, the electronic products in question are generally manufactured, and repaired under warranty, in the same nations, which anti-reuse recyclers depict as primitive. Reuse-based e-recyclers believe that fair-trade incentives for export markets will lead to better results than domestic shredding. There has been a continued debate between export-friendly e-cycling and increased regulation of that practice. In the European Union, debate regarding the export of e-waste has resulted in a significant amendment to the WEEE directive (January 2012) with a view to significantly diminishing the export of WEEE (untreated e-waste). During debate in Strasburg, MEPs stated that "53 million tonnes of WEEE were generated in 2009 but only 18% collected for recycling" with the remainder being exported or sent to landfill. The Amendment, voted through by a unanimous 95% of representatives, removed the re-use (repair and refurbishmet) aspect of the directive and placed more emphasis upon recycling and recovery of precious metals and base metals. The changes went further by placing the burden upon registered exporters to prove that used equipment leaving Europe was "fit for purpose". Currently, pieces of government legislation and a number of grassroots efforts have contributed to the growth of e-cycling processes which emphasize decreased exports over increased reuse rates. The Electronic Waste Recycling Act was passed in California in 2003. It requires that consumers pay an extra fee for certain types of electronics, and the collected money be then redistributed to recycling companies that are qualified to properly recycle these products. It is the only state that legislates against e-waste through this kind of consumer fee; the other states' efforts focus on producer responsibility laws or waste disposal bans. No study has shown that per capita recovery is greater in one type of legislated program (e.g. California) versus ordinary waste disposal bans (e.g. Massachusetts), though recovery has greatly increased in states which use either method. 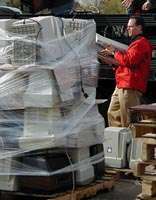 As of September, 2006, Dell developed the nation’s first completely free recycling program, furthering the responsibilities that manufacturers are taking for e-cycling. Manufacturers and retailers such as Best Buy, Sony, and Samsung have also set up recycling programs. This program does not accept televisions, which are the most expensive used electronic item, and are unpopular in markets which must deal with televisions when the more valuable computers have been cherry picked. Another step being taken is the recyclers’ pledge of true stewardship, sponsored by the Computer TakeBack Campaign. It has been signed by numerous recyclers promising to recycle responsibly. Grassroots efforts have also played a big part in this issue, as they and other community organizations are being formed to help responsibly recycle e-waste. Other grassroots campaigns are Basel, the Computer TakeBack Campaign (co-coordinated by the Grassroots Recycling Network), and the Silicon Valley Toxics Coalition. No study has shown any difference in recycling methods under the Pledge, and no data is available to demonstrate difference in management between "Pledge" and non-Pledge companies, though it is assumed that the risk of making false claims will prevent Pledge companies from wrongly describing their processes. Many people believe that the U.S. should follow the European Union model in regards to its management of e-waste. In this program, a directive forces manufacturers to take responsibility for e-cycling; it also demands manufacturers' mandatory take-back and places bans on exporting e-waste to developing countries. Another longer-term solution is for computers to be composed of less dangerous products and many people disagree. No data has been provided to show that people who agree with the European model have based their agreement on measured outcomes or experience-based scientific method. Electronic waste dump at Agbogbloshie, Ghana. Organized criminals commonly search the drives for information to use in local scams. E-waste presents a potential security threat to individuals and exporting countries. Hard drives that are not properly erased before the computer is disposed of can be reopened, exposing sensitive information. Credit card numbers, private financial data, account information and records of online transactions can be accessed by most willing individuals. Organized criminals in Ghana commonly search the drives for information to use in local scams. Government contracts have been discovered on hard drives found in Agbogbloshie, Ghana. Multimillion-dollar agreements from United States security institutions such as the Defense Intelligence Agency (DIA), the Transportation Security Administration and Homeland Security have all resurfaced in Agbogbloshie. There is also a major backlash from the consumer if there is a data breach in a company that is supposed to be trusted to protect their private information. If an organization has any consumer info on file, they must by law (Red Flags Clarification act of 2010) have written information protection policies and procedures in place, that serve to combat, mitigate, and detect vulnerable areas that could result in identity theft. The United States Department of Defense has published a standard to which recyclers and individuals may meet in order to satisfy HIPAA requirements. Countries have developed standards, aimed at businesses and with the purpose of ensuring the security of Data contained in 'confidential' computer media [NIST 800-88: US standard for Data Remenance][HMG CESG IS5, Baseline & Enhanced, UK Government Protocol for Data Destruction]. National Association for Information Destruction (NAID) "is the international trade association for companies providing information destruction services. Suppliers of products, equipment and services to destruction companies are also eligible for membership. NAID's mission is to promote the information destruction industry and the standards and ethics of its member companies." There are companies that follow the guidelines from NAID and also meet all Federal EPA and local DEP regulations. Receive hardware for destruction in locked and securely transported vehicles. Separate all aluminum from the waste metals with an electromagnet. Collect and securely deliver the shredded remains to an aluminum recycling plant. Mold the remaining hard drive parts into aluminum ingots. The Asset Disposal and Information Security Alliance (ADISA) publishes an ADISA IT Asset Disposal Security Standard that covers all phases of the e-waste disposal process from collection to transportation, storage and sanitization's at the disposal facility. It also conducts periodic audits of disposal vendors. An iMac G4 that has been repurposed into a lamp (photographed next to a Mac Classic and a flip phone). 1 2 Royte, Elizabeth (2005-08-01). "E-gad! Americans discard more than 100 million computers, cellphones and other electronic devices each year. As "e-waste" piles up, so does concern about this growing threat to the environment.". Smithsonian Magazine. Smithsonian Institution. Retrieved 2009-03-17. ↑ Nguemaleu, Raoul-Abelin Choumin; Montheu, Lionel (2014-05-09). Roadmap to Greener Computing. CRC Press. p. 170. ISBN 9781466506848. 1 2 3 Morgan, Russell (2006-08-21). "Tips and Tricks for Recycling Old Computers". SmartBiz. Retrieved 2009-03-17. ↑ Harris, Mark (2008-08-17). "E-mail from America: Buy-back gadgets". Sunday Times. Seattle, Washington. Retrieved 2009-03-10. 1 2 Prashant, Nitya (2008-08-20). "Cash For Laptops Offers 'Green' Solution for Broken or Outdated Computers". Green Technology. Norwalk, Connecticut: Technology Marketing Corporation. Retrieved 2009-03-17. In "Opinion". National Center For Electronics Recycling News Summary. National Center For Electronics Recycling. 2008-08-28. Archived from the original on 2011-07-26. Retrieved 2009-03-17. ↑ "Umwelt Schweiz, Electrical and electronic equipment". Retrieved 2006-11-24. ↑ "Waste Electrical and Electronic Equipment". ↑ "Final Rules on Cathode Ray Tubes and Discarded Mercury-Containing Equipment". U.S. Environmental Protection Agency. ↑ "House Panel Approves Bill to Aid Disposal of Unwanted Electronics". Congressional Quarterly. 2009-03-25. Archived from the original on 2009-03-30. Retrieved 2009-04-13. ↑ "Arkansas Computer and Electronic Solid Waste Management Act" (PDF). Archived from the original (PDF) on 2006-02-14. ↑ "A comparative study of e-waste recycling systems" (PDF). Sun-Woo Chung & Rei Murakama-Suzuki. ↑ Tim Hornyak (17 September 2010). "Recycling electronic waste in Japan: Better late than never". CNN. Retrieved 7 April 2012. ↑ "The global E-Waste Problem". ↑ Elizabeth Grossman (10 April 2006). "Where computers go to die -- and kill". Salon.com. Retrieved 7 April 2012. ↑ "How To Scrap Apart a Computer". Retrieved 12 March 2012. ↑ "How To Scrap A Television". Retrieved 12 March 2012. ↑ Hogye, Thomas Q. "The Anatomy of a Computer Recycling Process" (PDF). Retrieved 2016-08-13. ↑ "Sweeep Kuusakoski - Resources - BBC Documentary". www.sweeepkuusakoski.co.uk. Retrieved 2015-07-31. ↑ "Sweeep Kuusakoski - Glass Recycling - BBC filming of CRT furnace". www.sweeepkuusakoski.co.uk. Retrieved 2015-07-31. ↑ Kuhlenbeck, Phil (2006-06-09). "Law holds businesses responsible for disposal of computers". Austin Business Journal. Retrieved 2009-03-17. ↑ Perepelkin, Plato (2008-09-18). "Brisk sales of Apple's new 3G model have consumers scrambling to profit from their 'old' phones at Cashforiphones.com" (PDF). Computer Apple Digest. pp. 16–18. Retrieved 2009-03-05. ↑ Albanesius, Chloe (2008-07-28). "Gazelle Will Give You Cash for Your Gadgets". News and Analysis. PC Magazine. Retrieved 2009-03-05. 1 2 Bray, Hiawatha (2008-10-30). "Scrounge up cash with used gadgets". Boston Globe. Globe Newspaper Company. Retrieved 2009-03-05. ↑ "HP Environment: Product Return & Recycling". ↑ Haffenreffer, David (2003-02-13). "Recycling, the Hewlett-Packard Way". Financial Times. CNN. Retrieved 2009-03-17. ↑ Dean, Katie (2003-06-25). "Bill Aims to Cut Computer Clutter". Wired Magazine. Archived from the original on 2009-07-29. Retrieved 2009-03-17. 1 2 NNBW Staff (2009-03-30). "Cash-strapped consumers turn to laptops recycler". Northern Nevada Business Weekly. 7 (34). Retrieved 2009-04-13. ↑ "CRC History - Computer Recycling Center". www.crc.org. Retrieved 2015-07-29. ↑ ""Two Decades After the Koko Incident" by Dr. S. Gozie Ogbodo". digitalcommons.law.ggu.edu. Retrieved 2015-07-29. ↑ "E-Wasted Timeline". www.e-wastedmovie.com. Retrieved 2015-07-29. ↑ "About us - Swico Recycling". www.swicorecycling.ch. Retrieved 2015-07-29. ↑ Lohr, Steve (1993-04-14). "Recycling Answer Sought for Computer Junk". The New York Times. ISSN 0362-4331. Retrieved 2015-07-29. ↑ "Where does e-waste end up?". www.greenpeace.org/. Greenpeace. 24 February 2009. Retrieved 2015-07-29. ↑ Kinver, Mark (2007-07-03). "Mechanics of e-waste recycling". BBC. Retrieved 2015-07-29. ↑ "Bulgaria opens largest WEEE recycling factory in Eastern Europe". www.ask-eu.com. WtERT Germany GmbH. 12 Jul 2010. Retrieved 2015-07-29. ↑ "EnvironCom opens largest WEEE recycling facility / waste & recycling news". www.greenwisebusiness.co.uk. The Sixty Mile Publishing Company. 4 March 2010. Retrieved 2015-07-29. ↑ Goodman, Peter S. (11 Jan 2012). "Where Gadgets Go To Die: E-Waste Recycler Opens New Plant In Las Vegas". The Huffington Post. Retrieved 2015-07-29. ↑ Moses, Asher (19 Nov 2008). "New plant tackles our electronic leftovers - BizTech - Technology - smh.com.au". www.smh.com.au. Retrieved 2015-07-29. 1 2 3 "Most U.S. Electronic Waste is Pollution-and-Worker-Danger Shipped Overseas". Ethical Shopping. 19 November 2007. Retrieved 29 November 2007. ↑ "Silicon Valley Toxics Coalition". Retrieved 30 October 2007. ↑ "E-Waste Politics". Scarlett, Lynn - Reason Foundation. 4 October 2000. Retrieved 23 November 2012. ↑ "The Importance of Responsible Recycling for Used Electronics". Electronic Industries Alliance. 2007. Retrieved 29 November 2007. ↑ "Much toxic computer waste lands in Third World". USA Today. 25 February 2002. Retrieved 27 September 2007. ↑ Melanie Kozlan (2 November 2010). "What is 'E-Waste' & How Can I Get Rid Of It?!". Four Green Steps. Retrieved 4 November 2010. ↑ "Revenge of the TV Monitor Zombies". Discovery News. 30 July 2010. Retrieved 8 January 2011. ↑ "What the Recast WEEE Directive means for the UK". IT-Green. Retrieved 10 February 2012. ↑ "Electronic Waste Recycling Act of 2003: Covered Electronic Waste Payment System (SB 20/SB 50)". California Integrated Waste Management Board. 1 November 2007. Retrieved 28 November 2007. 1 2 Moore, Elizabeth Armstrong. "Momentum Builds for 'Revolution' to Recycle Electronic Waste." 31 July 2006. The Christian Science Monitor. Accessed 29 November 2007. .
1 2 3 "Africa’s Agbogbloshie Market Is a Computer Graveyard" NewsBreakingOnline.com. Web. 20 February 2011. ↑ Doctorow, Cory. "Illegal E-waste Dumped in Ghana Includes Unencrypted Hard Drives Full of US Security Secrets." Boing Boing. 25 June 2009. Web. 15 March 2011. ↑ "ID Theft Center". 2009-01-01. Retrieved 2009-08-14. ↑ "NAID". 2009-01-01. Retrieved 2009-08-14. Wikimedia Commons has media related to Electronic recycling.